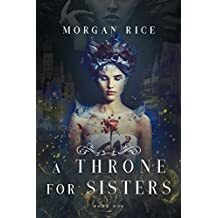 About the Book: In A THRONE FOR SISTERS (Book one), Sophia, 17, and her younger sister Kate, 15, are desperate to leave their horrific orphanage. Orphans, unwanted and unloved, they nonetheless dream of coming of age elsewhere, of finding a better life, even if that means living on the streets of the brutal city of Ashton. About the Author: Morgan Rice is the #1 bestselling and USA Today bestselling author of the epic fantasy series THE SORCERER’S RING, comprising seventeen books; of the #1 bestselling series THE VAMPIRE JOURNALS, comprising twelve books; of the #1 bestselling series THE SURVIVAL TRILOGY, a post-apocalyptic thriller comprising three books; of the epic fantasy series KINGS AND SORCERERS, comprising six books; of the epic fantasy series OF CROWNS AND GLORY, comprising 8 books; and of the new epic fantasy series A THRONE FOR SISTERS. Morgan’s books are available in audio and print editions, and translations are available in over 25 languages. TURNED (Book #1 in the Vampire Journals), ARENA 1 (Book #1 of the Survival Trilogy), A QUEST OF HEROES (Book #1 in the Sorcerer’s Ring) and RISE OF THE DRAGONS (Kings and Sorcerers—Book #1) are each available as a free download on Amazon! My Review: Morgan Rice's imagination is limitless. In another series that promises to be as entertaining as the previous ones, the author presents us with the tale of two sisters (Sophia and Kate), orphans, fighting to survive in a cruel and demanding world of an orphanage. After escaping into the streets of their city, each one takes a different path, although still connected by their unique capability of staying in touch with each other through their minds. That same power allow them to read other's thoughts. Sophia's path lead her to the court and to the arms of the brother to the heir of the throne. Kate is more interested in battles, swords and the son of the blacksmith. And their journey is full of events and surprises and in each turn of a page you will find yourself cheering for our heroines to succeed surpassing their obstacles. The world and characters are well developed and the action is present all over, making this book an instant success. Life cannot get better! I recommend this book to the permanent library of all readers that love a well written fantasy book. They will embark in a journey full of action, heartbreak and magic, and they will not be disappointed. This is the first book of a trilogy and I can hardly wait to put my hands on the second and third book!